Stop it. Eight changes in 13 years is not stable tax policy. 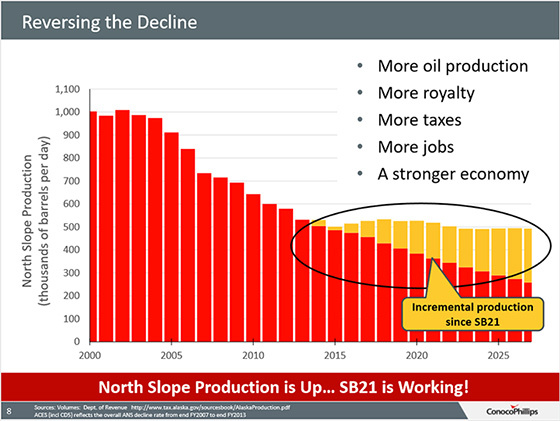 After three years of low oil prices and recession, industry job losses are stabilizing, activity on the North Slope is picking up again, the price of oil is above $65 per barrel, and the oil production decline at Prudhoe Bay has been stopped for a third year in a row. Alaskans and oil and gas companies are becoming increasingly optimistic about the future of Alaska’s most important industry. Our current tax structure is working. Let’s stay the course to increase investment and production in Alaska’s number one resource and to KEEP Alaska Competitive. The KEEP Alaska Competitive Coalition, five thousand members strong, is a broad-based group of Native corporations, businesses, unions and individual Alaskans who share one common objective: We care deeply about our state and its economic future. KEEP knows that stable, competitive tax policies are the key to creating investment and jobs for Alaskans. We recognize we must address our fiscal crisis, and make meaningful progress toward fixing it, so that our oil industry, and all our resource industries, can survive and prosper. The oil industry pays for about 70 percent of Alaska’s government services. Oil has funded our schools, roads, airports and public safety. Oil strongly supports our charities and has created about one-third of Alaska’s jobs. Oil has funded Alaska’s $60 billion permanent fund and has allowed Alaskans the luxury of not having to pay state income or sales taxes. But times have changed. It’s been a great ride, but it’s not sustainable. Alaska is in a recession due to low oil prices and an unsustainable fiscal situation that discourages investment. After months of stalemate, the legislature once again changed the state’s oil tax system, the seventh change in 12 years. But that’s not enough for some legislators. A legislative working group on oil taxes will convene later this year to review the state’s oil tax system. KEEP strongly recommends this working group make no further changes to Alaska’s oil tax policy. We cannot continue to threaten the oil industry with unstable tax policies and expect further investment from them. This is where KEEP members can make a difference. Please remind your representatives in Juneau to not kill our resource industries with yet another tax increase for the industry that is the economic foundation of our state. Once again, thank you for your support of the KEEP Alaska Competitive Coalition. We look forward to working with you to ensure Alaska will be open for business for years to come. KEEP Alaska Competitive is a 501(c)(6) organization composed of individual Alaskans, Alaska Native organizations, businesses and labor groups who care deeply about our long-term economic future. We do not take contributions from oil producers. Alaska is in a recession due to low oil prices and declining production. We have the ability to fix our fiscal problems.